Global warming is changing our sources of fresh water and reducing the amount of land available for growing crops. Creating today’s energy supply requires water and biomass, and the supply of water and biomass requires energy. "Global warming is changing our sources of fresh water and reducing the amount of land available for growing crops." 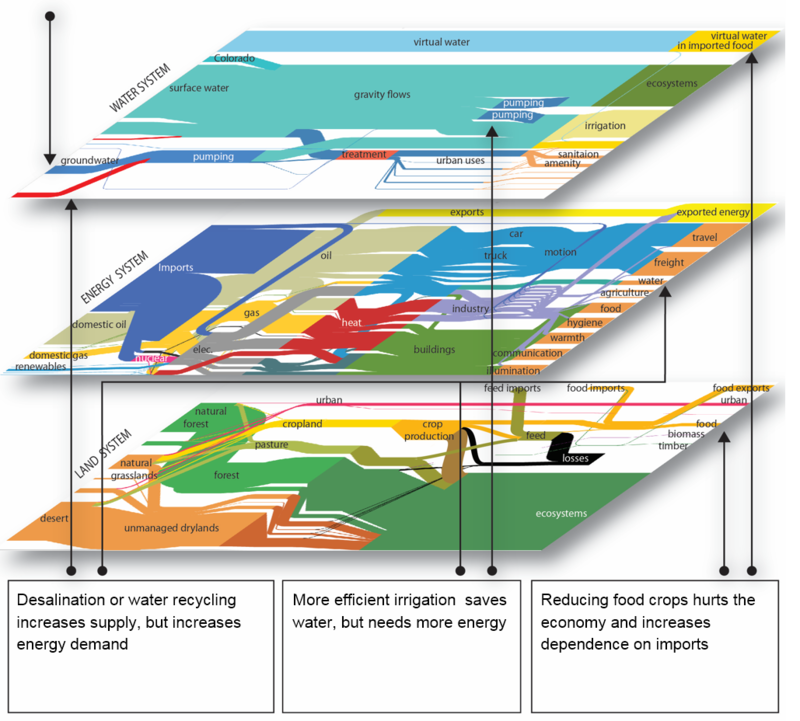 The diagrams to the right illustrate today’s use of freshwater and land in different regions and reveal four main connections with the energy system which is the main cause of global warming. 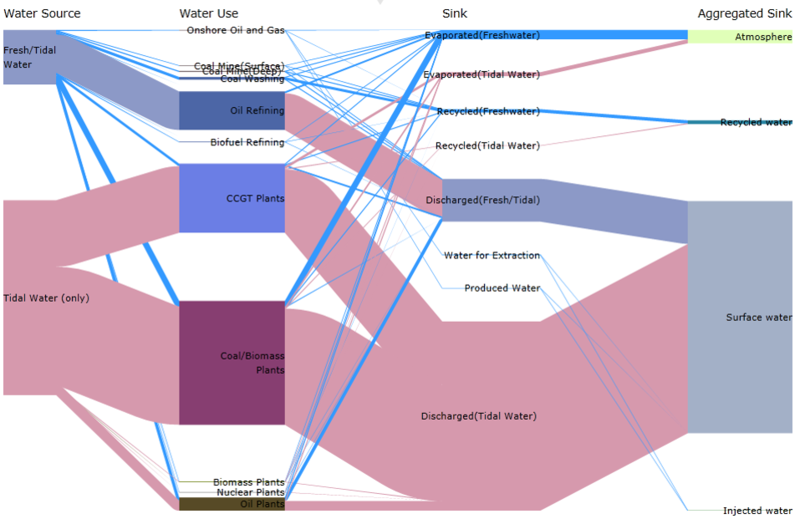 As conventional supplies are drained, we use more energy to access freshwater. In California, groundwater levels are falling dramatically, requiring more energy to pump energy from below the surface. In Malta, sufficient freshwater can be found only by energy intensive desalination of sea water from the Mediterranean. 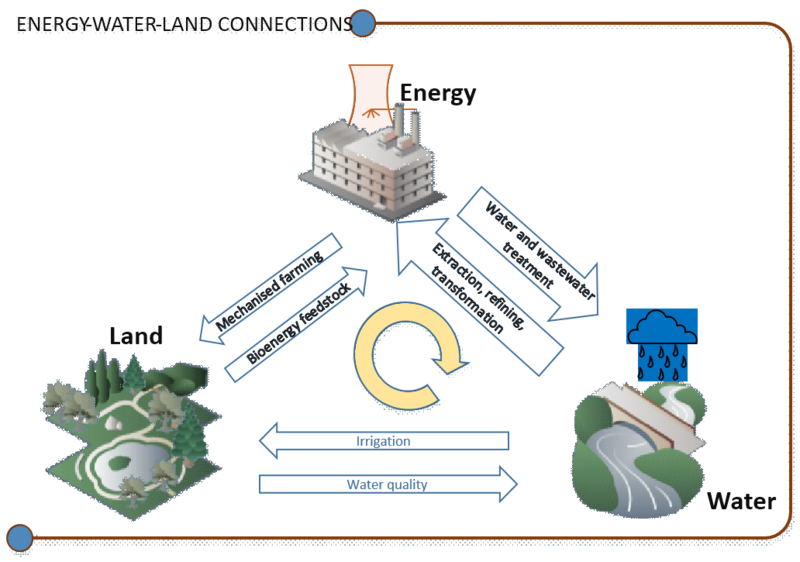 In China, water use for power generation alone could exceed the overall industrial sector target of their “3 Red Lines” industrial water policy by 2035 unless drastic measures are taken to reduce consumption and transition to low-carbon energy technologies. The rate at which plants grow depends primarily on how much water they can access. 70% of the world’s fresh water is used for irrigation, and this keeps increasing as we expand our use of biofuels and demand ever more meat. You could deliver eighty times more satisfying meals to humans from the crops fed to a cow than you can by eating the beef from the cow. As the world’s population increases and becomes richer, our demand for meat is growing rapidly and don’t forget that the methane released as cows and other ruminants digest plants is also a major contributor to global warming. 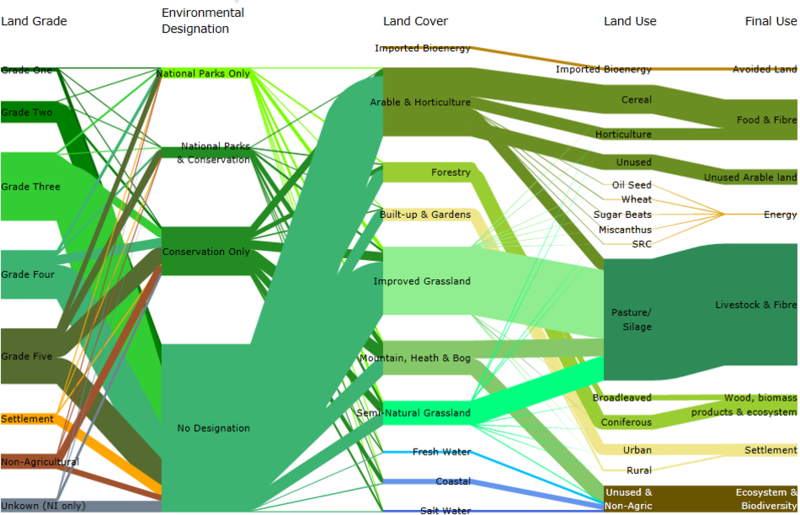 In the UK, we deal with these problems by exporting them: we currently import 52% of our food, and most of our biomass is imported from Canada (Figure 2). 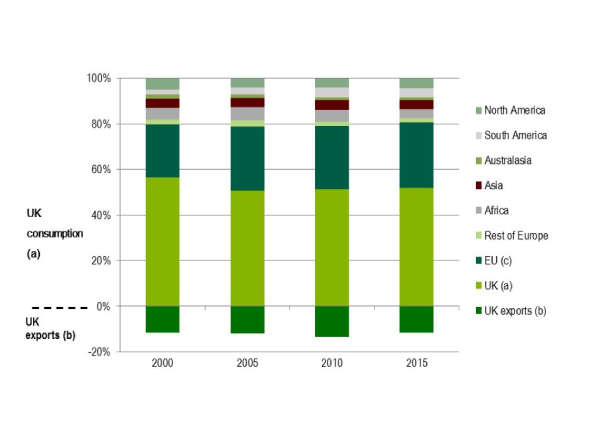 Globally, our main response to date to shortages of freshwater and biomass has been to use more energy, to desalinate or transport water, for irrigation and for fertilisers. 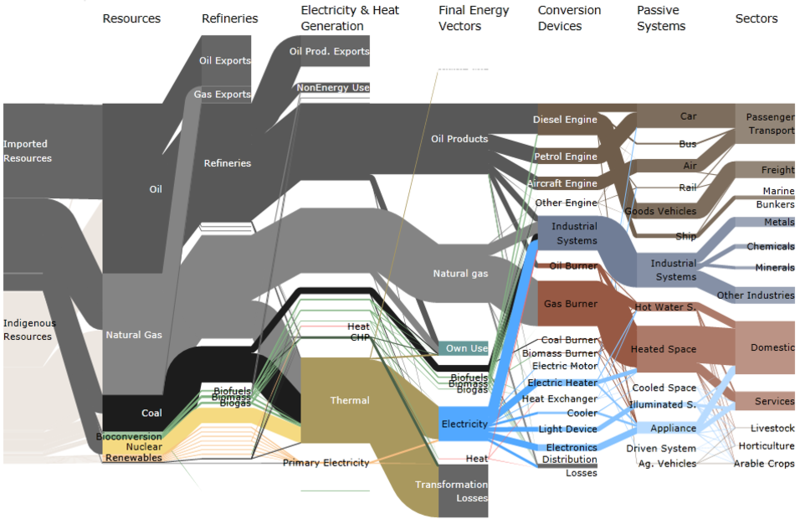 But our energy supply is mainly from fossil fuels so this increases the emissions that cause global warming. Several of our researchers are collaborating on projects relating to water and land stress. The Case for the Carbon Plan is made in our paper ''Land Use Implications Of Future Energy System Trajectories"
Figure 1: We use energy-intensive fertilisers to increase crop productivity and we use water to cool electricity power plants.